Random items laying around the house. For a sorted list, List of Items. 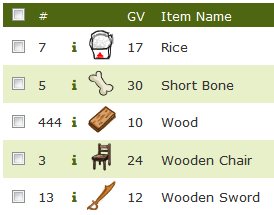 For a catalogue of all item pages in this wiki, see the Item category page. An Item is anything which can be placed in an user's house for the Resident or pets to use. Most items can be found or made by pets. The term item itself is very broad, and can describe non-living things - e.g. food, equipment, etc. - as well as certain living things: Bottled Faeries, plants, etc. Items may be used, traded, sold or given away. Some items can be recycled. The basic TerrePets currency - money - do not exist as physical items. Item rarity is a colour-coded scale of the ratio of the existing number of the item over the total number of all existing items in the game. Items donated to the Museum don't count as "existing" items. Items that can be bought with Favor. Every equippable item in the game has a durability. These items deteriorate while being equipped by a pet during hourly actions. After being equipped for a while, the item's condition gradually changes from Brand-new to Worn before breaking and leaving behind a Rubble for you to sift through. Worn equipment display a reddish background to indicate that the item is about to break. All equipment have a subcategory under durability called condition. Depending on what a pet decides to do during hourly actions, the condition of the pet's equipped item may deteriorate. Deteriorating beyond the Worn condition will cause the item to be destroyed and turned into Rubble. There is currently no way to repair equipment. When you gain new items in your house, their information is bolded for 5 minutes so you can find them with ease. This includes purchased items, prepared items, items your pets collected, and items you've just moved into the room. This page was last modified on 27 February 2018, at 20:03. This page has been accessed 8,528 times.